What does genius look like? One place to start is the hair, to judge from photographs of Albert Einstein. The famous physicist was not the first to suggest that an unkempt mane is a sure sign of an active mind. 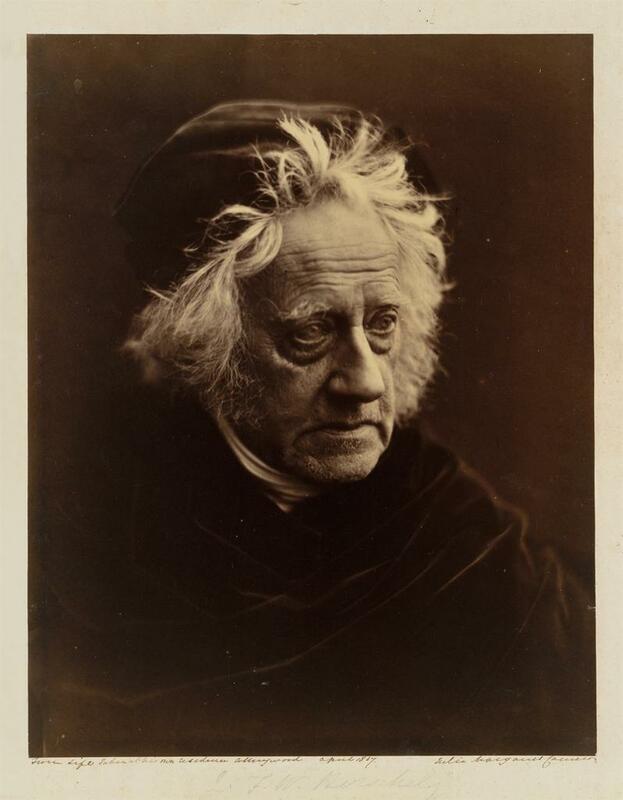 When the Victorian Julia Margaret Cameron produced this portrait of John Herschel in 1867, she had waited three years “to take this noble head of my great master,” and she was not going to miss her chance to highlight his genius. For Cameron in particular, Herschel was “Teacher and High Priest,” who sent her the first photographs she had ever seen. She demanded that Herschel wash his hair and tousle it, and wild tufts of white hair became an external sign—a visual—for the internal workings of the mind. As an art historian, I have read Richard Holmes’s Age of Wonder with one eye on the visuals. In this regard, I must take Holmes to task for his treatment of most illustrations in the book as just that—illustrations. As the historian Raphael Samuel reminded us, we can find valuable historical knowledge in images, but we must approach them carefully: looking not for the information that we gain from them, but rather focusing on the information that we bring to them. What do Richard Holmes’s insights mean, then, for the visual art of this period? And what might this add for our understanding of a slightly later cultural moment, which is my own period of research specialization. The appearance of Sir John Hershel in the book, often viewed as a Victorian figure, raises interesting questions in this regard. Holmes introduces Herschel in Chapter 9, where he already appears as the product of a different generation. He is the “apprentice” to his father the “sorcere” William Herschel, and he is a foil that allows the author to update the reader on the fates of the elder Herschel, his sister Caroline, and Sir Joseph Banks. Humphry Davy continues to be the main focus of the narrative; Holmes writes a eulogy for the age of wonder in his consideration of Davy’s Consolations in Travel, or, the Last Days of the Philosopher from 1830, even as he re-affirms what he calls “the awe-inspiring” and “visionary nature of the sciences.” The following year, 1831, seems like a decisive break: Charles Darwin departs for his voyage on The Beagle and the “Young Scientists” introduced in chapter 10, Darwin among them, announce a new generation. Holmes notes that “scientist” was recognized in the Oxford English Dictionary in 1840, the same year that John Herschel dismantled his father’s old forty-foot telescope. The year before, Herschel commemorated his father’s achievement by making it the subject of some of his first successes with the incipient medium of photography. Herschel produce a number of negatives, including a blue one using the process known as cyanotype, and as well as “positives” printed from a glass negative, a support that did not become standard practice until the 1850s. The “eye” of the camera lens memorializes the sweeping “eye” of the telescope that enabled the elder Herschel to scan the heavens. In this, it seems to declare a very different set of ambitions, leaving aside the fact that the son quite literally dismantles the work of the father. The younger Herschel gives us the means and the apparatus. How very Victorian! Utilitarianism and professionalization come first. The elder Herschel, in contrast, keeps his eyes and his desire focused on the heavens, not unlike William Blake’s illustration of a star-gazer from 1793. Yet at least one Victorian view of Herschel would seem to contradict this interpretation. We need look no further than Julia Margaret Cameron’s photographic portrait of Herschel to find the inspired genius. While not included in The Age of Wonder, Holmes himself references this photograph at the very end of his tale, where Herschel is recognized as the leading public scientist of the mid-Victorian era. As he describes it “his kindly face, encircled by a sunlike corona of white hair, was famously photographed by Julia Margaret Cameron, using a process that he himself had partly invented.” (More on that in a moment). Draped in black, Herschel faces the lens with the seriousness of an Old Testament prophet even as Cameron eschews the usual focus and finish of the portrait photograph. In a footnote, Holmes explains that Herschel appears both “benign” and “eccentric,” a combination that “defined the Victorian ideal of the scientist.” And here I must disagree with Holmes’s assessment: there is nothing particularly “Victorian” about the “eccentricity” of this image: as Ludmilla Jordanova has recently suggested, “romantic idioms” continued to inform depictions of scientists into the twentieth century. Furthermore, the extreme play of light and dark in Cameron’s photograph is meant to address the centrality of Herschel’s theorization of light to the invention of photography. If we go back to 1830, and think not of Davy’s Consolations but instead of Herschel’s important essay “Light,” we might be able to expand the boundaries of the age of wonder. This monumental article for the Encyclopedia Metropolitana of 1830 (it ran to some 240 pages) suggests that the “Age of Wonder” prompted the cultural imperative of photography. Acclaimed as the Isaac Newton of his generation, Herschel occupies a special place in the history of photography. His chemical experiments of 1819 led to its invention, and it was Herschel who first described the results of this new process as a “negative” that prints a “positive.” His language still determines the way we envision this process of image making: he was the first to use the term “snap shot,” and he coined the term “photography,” or light writing, to describe the experiments of his friend William Henry Fox Talbot. In his essay, Herschel proclaims the centrality of sight to experience, declaring that “sight is the most perfect of our sense; the most various and the most accurate in the information it affords us; and the most delightful in its exercise.” This celebration of the visual comes as no surprise when we examine Herschel’s accomplished drawings and watercolors such as this botanical specimen from 1824. As Herschel continues, “Apart from all considerations of utility, the mere perception of light is in itself a source of enjoyment.” This assertion of the delight in nature, then takes a turn for the divine: “When to this we join the exact perception of form and motion, the wondrous richness and variety of colour, and the ubiquity conferred upon us by just impressions of situation and distance, we are lost in amazement and gratitude.” Herschel’s observations here are infused with the language of wonder, as he shifts easily between “exactness” and “impressions.” As scholars such as Geoffrey Batchen and Douglas Nickel have argued, this pairing underpins the invention of photography—the first photographic process, seen here in an example by William Henry Fox Talbot, involved taking the object itself (the exact thing) and allowing the sun to leave its “impression.” Early photographers such as Talbot discussed this process in the same way as “marvelous” “fairy pictures,” the product of “sorcery” “alchemy” “natural philosophy” that was a the same time “natural magic.” According to Douglas Nickel, these are the “Romantic epistemological preconditions” that allowed photography to develop. Holmes’s Age of Wonder describes not just scientific discovery but also wonder at the unknown, of beauty and terror. 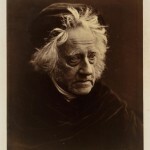 If we look a different “impressions” of John Herschel from Julia Margaret Cameron’s 1867 sitting, known not as “the Portrait of Sir John Herschel” but “The Astronomer,” we might see them with new eyes, filtered through the ideas of 1819, 1830, and 1867. The astronomer still scans the heavens. This entry was posted in Age of Wonder, Collections and tagged Art. Bookmark the permalink. Great article Morna. This is an interesting site. I’m part of a group that is thinking about something similar, but more visual and focused toward students. I’d be interested to talk to you about your experience. Will you be at CAA?